Thai food offers many delicious dishes flavored with spices, lemon-grass or coconut - although different regions of Thailand, each tend to have their own preferred ingredients - for example, coconut milk and turmeric in the South, and lime juice in the Northeast. No matter what part of the country a dish is from, all Thai dishes or meals aim to achieve a balance between fundamental flavors common to the cuisine: spicy hot, sour, sweet and salty, as well as optionally bitter. Rice forms an important and fundamental part of Thai food, and jasmine rice (which is native to Thailand) is used in many dishes as well as being served plain. Gai pad khing - Fried chicken with vegetables and sliced ginger. Green curry - A curry flavored with coconut, green chillies, and Thai basil, containing vegetables and chicken or fish. Pad see ew - Noodles stir-fried with thinly sliced pork or chicken, and flavored with fish sauce. Pad Thai - Fried rice noodles with fish sauce, sugar, lime or tamarind, peanuts and egg, mixed with chicken, tofu or seafood. Red curry - A very hot curry made with plenty of red chillies. Satay - Originally from Indonesian cuisine (where it is known as "Sate") satay has also become a popular dish in Thailand. 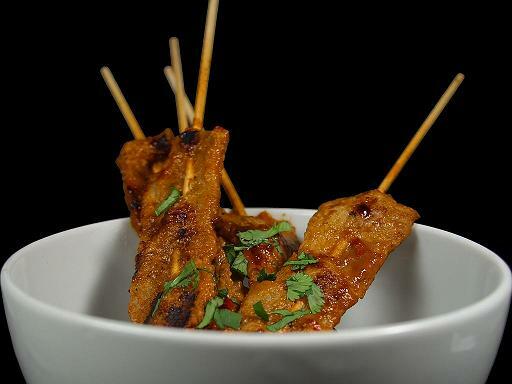 Satay is grilled meat (usually chicken or pork), usually on skewers, served with cucumber salad and a peanut sauce. Som tam - Grated papaya salad. There are several variations: the salad can be served with salted black crab, with peanuts, shrimps and palm sugar, or with salted fish, eggplant, and long beans. Tom yam - A hot and sour soup made with seafood (often shrimp) or chicken. Yellow curry - A curry that is colored using fresh turmeric (hence its yellow color), and also containing black mustard seeds, cumin, nutmeg, brown sugar, kaffir lime leaves, lime juice, coconut milk and fish sauce. From iconic dishes like phat thai and phat si ew to lesser-known (at least Stateside) treasures like kuaytiaw reua (boat noodles), noodles represent many of the most delicious and satisfying dishes in the Thai culinary canon. In POK POK Noodles, chef Andy Ricker shares recipes for his favorites--including noodle soups, fried noodles, and khanom jiin, Thailand's only indigenous noodle. Filled with stunning food and location photography and the thoughtful, engaging storytelling that has earned Ricker legions of fans, this book will become an instant classic for armchair travelers and lovers of Thai food and culture. New to Instant Pot Cooking? Well, here you will find the detailed instructions summarized to understand the basics of your favourite kitchen tool. Whether you are a complete beginner or an advanced user, you will make great use of this cookbook and the recipes in it. What will you find it this cookbook? A guide for total beginners on how to use the Instant Pot and its basic functions. Together with detailed instructions on how to start using your Instant Pot, you will find mouth-watering recipes that are very simple to make. Just get your Instant pot ready and let my cookbook guide y our through the simplified steps required to cook each meal. All meals included nutritional information, which will make it ideal to organize how many serves you want to cook, depending on how many people are going to enjoy the delicious meals included in this Instant Pot Recipe Book.The in-depth nutritional information will be useful also if you are following a diet or simply want to check your daily calorie intake in check. I hope you will enjoy this ideal Instant Pot Cookbook for Instant Pot Beginners and Advance users. Now… get to the kitchen and start cooking! A Paleo diet is extremely healthy and you should opt for it if you need to make a significant change in your life. In addition, slow cooking is one of the most popular cooking methods these days that allows you to prepare delicious dishes for you and your loved ones. Slow cooking helps you make healthy meals in a very simple way. So, why shouldn't you combine a healthy diet with slow cooking? The Paleo diet is one of the easiest and simple ones to follow. It brings you so many health benefits and it will help you lose weight in no time. Under the cover you will find over 250 impressive Paleo slow cooked recipes! Get your copy and start cooking! After decades spent traveling throughout Thailand, Andy Ricker wanted to bring the country’s famed food stateside. In 2005 he opened Pok Pok, so named for the sound a wooden pestle makes when it strikes a clay mortar, in an old shack in a residential neighborhood of Portland, Oregon. Ricker has since gone on to open six more wildly popular Pok Pok restaurants, and today he is considered one of the leading American voices on Thai cooking. In this much-anticipated debut cookbook, Ricker shares seventy of the most popular recipes from Thailand and his Pok Pok restaurants—ranging from Khao Soi Kai (Northern Thai curry noodle soup with chicken) to Som Tam Thai (Central Thai–style papaya salad) to Pok Pok’s now-classic (and obsessed-over) Fish-Sauce Wings. But Pok Pok is more than just a collection of favorite recipes: it is also a master course in Thai cooking from one of the most passionate and knowledgeable authorities on the subject. Clearly written, impeccably tested recipes teach you how to source ingredients; master fundamental Thai cooking techniques and skills; understand flavor profiles that are unique to Southeast Asian cuisine; and combine various dishes to create show-stopping, well-balanced meals for family and friends. Filled with thoughtful, colorful essays about Ricker’s travels and experiences, Pok Pok is not only a definitive resource for home cooks, but also a celebration of the rich history, vibrant culture, and unparalleled deliciousness of Thai food. Thai takeout meets authentic, regional flavors in this collection of 100 recipes for easy, economical, and accessible Thai classics--from the rising star behind the blog She Simmers. All of Leela’s recipes have been tested and tweaked to ensure that even the busiest cook can prepare them at home. With chapters on key ingredients and tools, base recipes, one-plate meals, classic rice accompaniments, and even Thai sweets, Simple Thai Food is a complete primer for anyone who wants to give Thai cooking a try. By the end of the book, you’ll be whipping up tom yam soup and duck red curry that will put your local takeout joint to shame. But perhaps more importantly, you’ll discover an exciting new world of Thai flavors and dishes—including Stir-Fried Chicken with Chile Jam, Leaf-Wrapped Salad Bites, and Crispy Wings with Three-Flavored Sauce—that will open your eyes to all the wonderful possibilities that real Thai cooking has to offer. Growing up in Thailand, Pailin Chongchitnant spent her childhood with the kitchen as her playground. From a young age, she would linger by the stove, taking in the sight of snowy white coconut being shredded, the smell of lemongrass-infused soups, and the sound of the pestle pounding against the granite mortar. Years later, as a Cordon Bleu–educated chef in San Francisco, Pailin vividly remembered the culinary experiences of her youth. And so, on YouTube, Hot Thai Kitchen was born. Combining her love of teaching with her devotion to Thai food, Pailin immediately connected with thousands of fans who wanted a friend and educator. In this much-anticipated cookbook, Pailin brings her signature warmth and impressive technique to Thai food lovers everywhere. She begins by taking readers on a beautifully photographed trip to Thailand to explore the culinary culture and building blocks central to Thai food. With foolproof and easy-to-follow instructions, Pailin breaks down the key ingredients, flavours, equipment, and techniques necessary to master authentic Thai cooking. Then, she shares her must-make recipes for curries, soups, salads, and stir-fries, including entire chapters on vegetarian and vegan dishes, dips and dipping sauces, and sumptuous Thai desserts. With QR codes to video tutorials placed throughout the book, you’ll be able to connect with Pailin online, too. Both a definitive resource and an extraordinary exploration of Thai cuisine, Hot Thai Kitchen will delight and inspire you in your Thai cooking journey. Start to burn fat step by step with this fantastic guide! This recipe book is a compilation of foolproof, easy recipes based on the complete Ketogenic Diet for beginners that you make feel better and better every day. Its benefits and limitations are covered in this Keto Diet cookbook as well, so there is no excuse for you not to start right away! For those who have already been able to make the mental conversion to change, then I trust, that you will find this a far more accessible and easy to maintain eating method than those you may have tackled in the past. I am convinced that just a few weeks on the Ketogenic diet will produce such good results that you will be encouraged to turn it into a permanent way of life. Keep in mind that you are not only limited to the recipes provided in this book! Just go ahead and keep on exploring until you create your very own culinary masterpiece! Stay healthy and stay safe! JAMES BEARD AWARD FINALIST • Welcome to a beautiful, deep dive into the cuisine and culture of northern Thailand with a documentarian's approach, a photographer's eye, and a cook's appetite. Known for its herbal flavors, rustic dishes, fiery dips, and comforting noodles, the food of northern Thailand is both ancient and ever evolving. Travel province by province, village by village, and home by home to meet chefs, vendors, professors, and home cooks as they share their recipes for Muslim-style khao soi, a mild coconut beef curry with boiled and crispy fried noodles, or spiced fish steamed in banana leaves to an almost custard-like texture, or the intense, numbingly spiced meat "salads" called laap. Featuring many recipes never before described in English and snapshots into the historic and cultural forces that have shaped this region's glorious cuisine, this journey may redefine what we think of when we think of Thai food. There are few cuisines that harness the balance of sweet, sour, salty, bitter, and spicy flavors better than Thai. 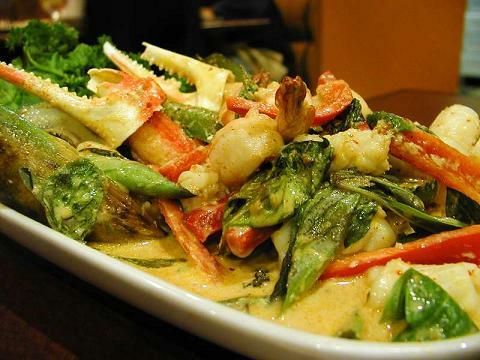 Yet when it comes to enjoying Thai food at home, most think their only option is takeout. However, with only a few key ingredients and basic techniques, you can cook quick, delicious Thai meals that the whole family will love. From the kitchen of her family’s Thai restaurant to her mother’s homemade Thai food, Danette St. Onge knows how to make Thai food accessible to anyone with the right ingredients, a little time, and a reliable Thai cookbook (hint: it’s this one!). In The Better-Than-Takeout Thai Cookbook, Danette makes it simple to try new ingredients and learn essential techniques. As you work your way through this Thai cookbook, you’ll become more comfortable with the fundamentals of Thai cooking. The clear explanations and tried-and-true recipes offered in The Better-Than-Takeout Thai Cookbook make it easier than ever to create your favorite Thai dishes. You’ll enjoy the Thai dishes you love without the hassle of waiting for overpriced delivery with The Better-Than-Takeout Thai Cookbook.